Re-gas of an Air conditioner Brisbane Area : Wall split System or Ducted Air Conditioning System Re-gas. When re-gassing an air conditioning unit the correct procedure should prevent the system from leaking again. All split systems have 2 main connection points which are joined using a flaring tool when the air conditioner is installed. The pipe connections if not flared properly or tightened to the correct torque may leak, which is the most common cause as to why an air conditioner needs to be re-gassed. If a system has been installed for a long period of time (over 6 years) the copper piping used in the installation can develop tiny holes, cracks from vibration that can allow the refrigerant to leak and eventually lose all of the refrigerant. A service technician may just top up the system with gas, this is not the correct procedure if there is no gas in the air conditioner. Only if the system is close to the correct temperature/pressure a refrigerant adjustment maybe possible. The correct way to re-gas an air conditioning system is that the refrigerant must be weighed inn, in accordance to the air conditioner manufacture. This is displayed on the sticker on the outdoor condenser unit, this refrigerant maybe R22, R410A or R32 which are the most common refrigerants in air conditioning. 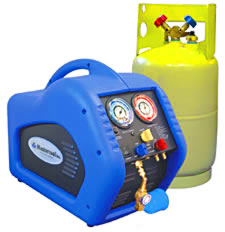 The refrigerant type can be found on the outside unit of your air conditioning system. We carry a twelve month warranty on new installation for any refrigerant leaks, any second hand air conditioner does not carry a warranty. Other various issues may arise with air conditioners over a few years old, which may cause refrigerant leaks because of the vibration within in the system which is separate from the actual pipe connections from installation. Re-gas unit (Weighed Inn using scales) and test run with the correct amount of refrigerant.